lisa.bongean@yahoo.com You have 2 weeks to claim your prize!!! I just think I am addicted to Primitive Gatherings in general! I love the quilts that you make and the fabric designs are out of this world. I just have to keep up collecting them all! I can’t wait to try this Whirlygig. I have limited sewing space so I buy charm packs,jelly rolls and layer cakers. On occassion I pick up a fat quarter as well. Love the quilts- they all are lovely. I like FQs and charm packs. They are small enough that I can buy and not feel guilty! I like 1/2 yd cuts, and fat quarters. Haven’t got into charm packs. You are so inspiring. Thanks so much. I find myself buying half yards more often than not – a fat quarter just isn’t enough! Here is a quilt you can make from all of the blocks collected from the HOP! 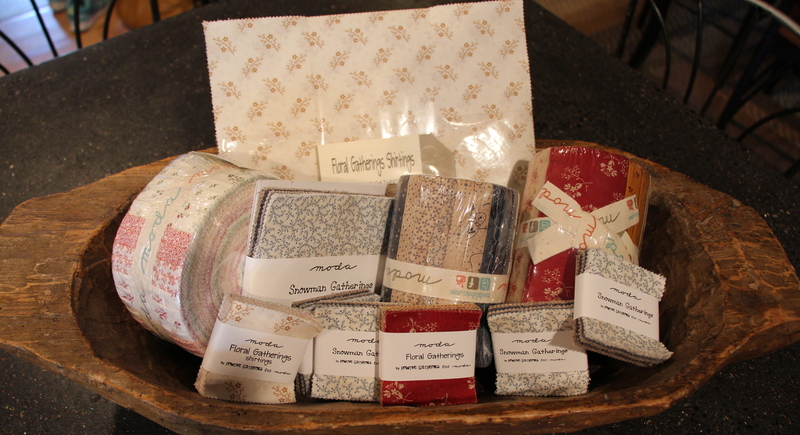 Made by Tammy…PS…Tammy is letting us publish a quilt she made from Floral Gatherings….stop back to see it! Congrats to the lucky winners! Enjoy! omg! I never usually win anything! I’m so excited! Thank you Lisa and Moda!